Noi Bai's two passenger terminals connect the northern part of Vietnam with destinations in Europe, East Asia, and major airports in Southeast Asia. Location of Noi Bai Airport on Google Maps. Two terminals in Noi Bai Airport service two different types of flights. Terminal One (T1), the older terminal, services domestic flights almost exclusively. Terminal Two (T2), opened in 2014, services international flights. The two terminals stand about half a mile apart – if you're transferring from a domestic flight to an international one, or vice-versa, take the travel time between terminals into account. A shuttle bus regularly services the gap between the two. As Noi Bai's international terminal, T2 offers services that can't be found in the older building: a left-luggage locker on the second floor and duty-free shops, among others. No direct flights are currently available between Noi Bai airport and airports in America. 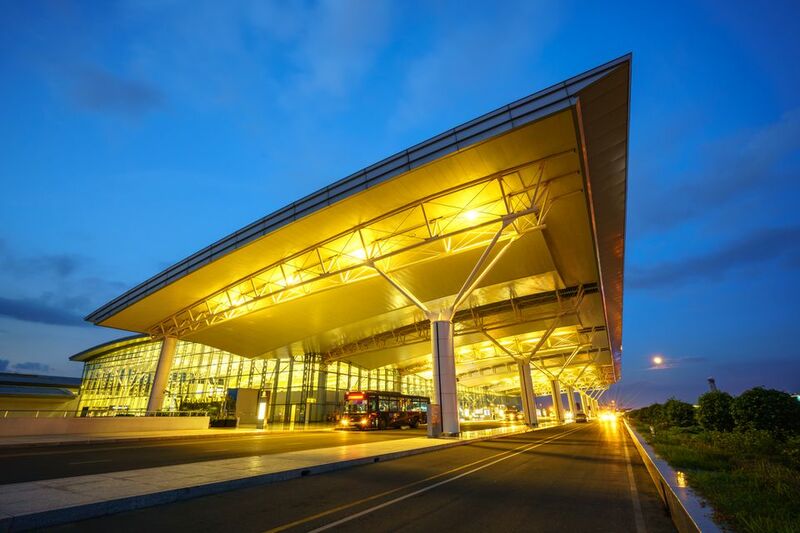 Until Vietnam and the U.S. reach an agreement, American travelers will need to fly into Hanoi via Asian hubs like Singapore's Changi Airport, Bangkok's Suvarnabhumi Airport, and Hong Kong's Chek Lap Kok Airport. Noi Bai is a major domestic hub for the Vietnamese air network; Jetstar and Vietnam Airlines connect Hanoi to other airports in Vietnam. Low-cost carriers like Cebu Pacific, AirAsia, JetStar, and Tiger Airways link Hanoi to other cities in Southeast Asia. US passport holders are required to obtain a visa to visit Vietnam. If you're a Vietnamese-American citizen, or an American married to a Vietnamese citizen, you may apply for a Five-Year Visa Exemption, which allows entry and up to 90 days continuous stay even without a visa. Papers, Please: For visa information about Southeast Asia in general, read this: Southeast Asia Visa Requirements for US Passport Holders. The bus is the cheapest way to get to Hanoi from the airport, but also the most crowded and the one that takes the most time. Bus 86 connects airport arrivals directly to Hanoi city stops. Each bus takes about an hour to arrive at its respective bus station, and costs VND 5,000 (about $0.30) per ride. New buses stop by about every 20 minutes. This yellow-and-orange bus follows a route from the airport, down through Hoan Kiem Lake and Hanoi Old Quarter, and terminating at the Hanoi Central Railway Station. Departing visitors can also board the bus as it returns to the airport from the city. Fare per person is VND30,000. Operating hours for the bus run from 5am to 10pm. Bus number 7 runs from Noi Bai to Kim Ma bus station, on the western side of Hanoi (Google Maps). Bus number 17 runs from Noi Bai to Long Bien bus station, on the northeast side of the Old Quarter (Google Maps). For the return trip from Hanoi to Noi Bai, go to Tran Quang Khai east of the Old Quarter to ride either buses 7 and 17; the route to the airport costs VND 9,000. Airport bus shuttles: Several "minibus" lines travel from Noi Bai Airport to Hanoi city center. Jetstar Pacific offers both drop-off at, and pick-up from, the Jetstar office at 206 Tran Quang Khai Street. The bus departs Noi Bai Airport shortly after the arrival of its flights – to score a seat, reserve and pay on the flight itself before boarding. Tickets cost VND 40,000 (about US$2) per way. Vietnam Airlines offers both drop-off at, and pick-up from, the Vietnam Airlines office at 1 Quang Trung Street (Google Maps). Buses depart every 30-40 minutes from Terminal 1 arrivals. Tickets cost VND 40,000 (about US$2) per way, payable at the queue. VietJet Air, Vietnam's own home-grown budget airline offers shuttle bus service between the airport's T1 and the city. Seats must be booked on the official VietJet website at least 24 hours before the flight. Taxi: taxi stands can be reached outside Noi Bai's arrival terminals; exit and walk to the first island beyond the arrivals terminal to find the queue of taxis. You may be approached by "helpful" people inside the terminal asking if you need a taxi – do not accept, as these touts will cheat you. Be forewarned: as with most everywhere around the region, taxis in Hanoi tend to attract the least honest operators in the travel business. Have a paper with the exact name and address of your hotel on hand, and show it to the taxi driver. Do not listen to the driver if he says the hotel is closed or otherwise unavailable – confirm it for yourself before you go. When you get to the destination, check the address to make sure he got the address right. Why the runaround? Taxis are paid commissions to take their fares to particular hotels. Do not fall for this trick, and assert your rights calmly but insistently. Read up on How to Avoid Taxi Scams. Another alternative: download the Grab app (iTunes/Android) to summon either a taxi or hired car to pick you up at the arrivals area. Internet access is required, so make sure you have a working SIM card with a working 3G-4G connection. Hired car. We recommend you get your hotel's official airport transfer to pick you up from Noi Bai. The porter will wait at the arrivals gate with a placard bearing your name, and he'll whisk you straight to your hotel from the airport. Sure, it may cost a little extra, but you pay for greater peace of mind in hustle-heavy Hanoi. You can also hire a third-party transfer service to either pick you up from the airport or take you there. Services like Cat Ba Express and Hanoi Transfer Service charge about US$17-23 per way.